Payday loans St. Catharines | PAY2DAY | $300 Cash Advance FREE! Great customer service and friendly staff. Fair borrowing rates. Thank you Jenn for being the best !! This was the second time i went in to the lake street location and Jen asked if i could post a review of my experience with pay2day Jen asked me the last time and i didn't get to it (sorry Jen). Both times when i went in Jen was very professional, very polite and made it a very pleasant experience. Jen is definately an asset to your company.sincerelyPaul W.
I went in today for the first time and the lady there was very professional. Didn't feel uncomfortable at all. I would definitely recommend this location.And the experience was very fast and easy. I was in and out in under 10min.Great job!! The customer service rep Jen was very helpful and kind. I never leave reviews but she was amazing. Thank you so much Jen! Karen was very friendly and helpful. Great customer service! Hassle free, quick, and easy. Thanks a bunch! Jen was extremely helpful and went over and above to help me out. Her level of customer service was beyond my expectations. Would recommend to anyone looking for a loan! Since the first day that I dealt with Pay2day, I was made to feel important. That my needs mattered. Karen was not only helpful, kind and pleasant..but she cared. Karen answered my questions with such warmth, it made me feel relaxed. Ever since that first day, I have proudly been a regular customer. I give Karen the credit for this..she has gone above and beyond. Karen is the epitome of customer service, truly should be. Clean place , excellent service , friendly staff... sharon n Jenn are so helpful and Karen such a sweetheart. Great customer service. Thank you. Did you know we moved our location? 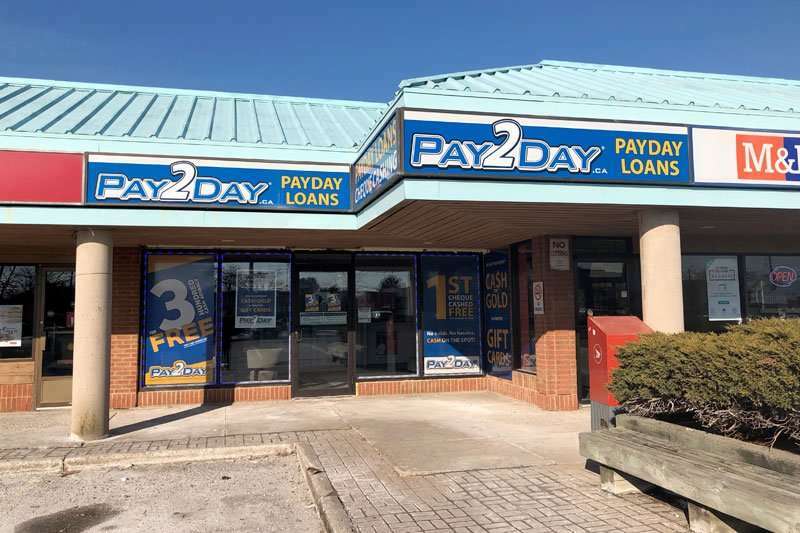 Pay2Day is now located between Quesadas and M&M Food Market at 353 Lake Street St. Catharines. After over 10 years of being inside That's Entertainment, we have a beautiful new store. 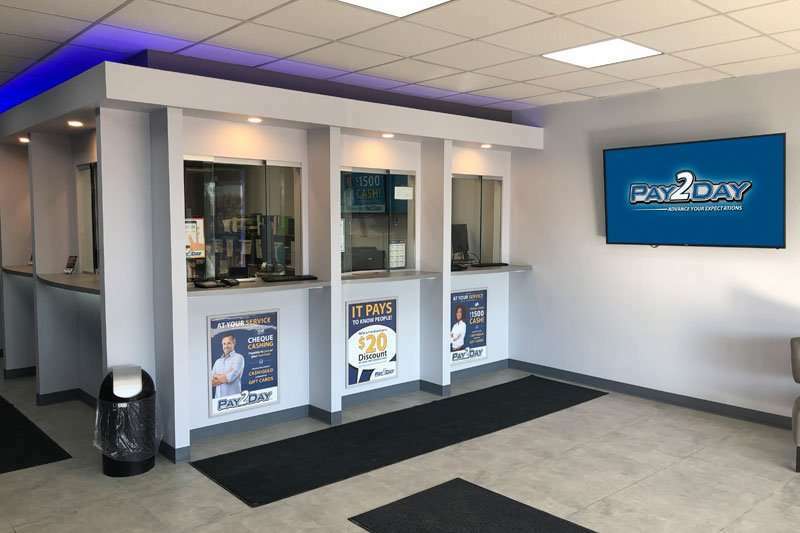 Come see us at our new location! Jen was fantastic. Great service and fair rates. Answered all my questions with great professionalism. I was accepted for the instant $300 cash advance which was great, and you can do partial payments if you can't pay it all in one which is awesome. I also was advised by Jenn about a little discount today from my payment which was also really convenient. Great experience. Jen and Kyle are super friendly and make the process super quick and easy! Great service. Fast and friendly staff. Helped today by Karen very helpful. Karen is amazing. Shes always very friendly and helpful. Thanks Karen for always being so friendly. Great service with a friendly smile. Amazing rates and services. The staff are always happy and helpful and I know them all Sharon, Kyle, Karen, Jen, and Nelly and the staff always remember me when I visit. Fast and friendly and I always leave with extra treats !!! 5 star service and staff highly recommend. Amazing professionalism delivered in a down to earth, known you forever type of comfort The gorgeous and stunning Jen. Coming here has been amazing and they treat me very well and they're super friendly, especially Sharon she has been incredible I highly recommend them. Nelly was amazing with me today. Her smile brightened up my mood and this store is for sure the best. Pay2day is fast and reliable. Always a friendly experience and Karen is awesome! Would definitely recommend to friends! 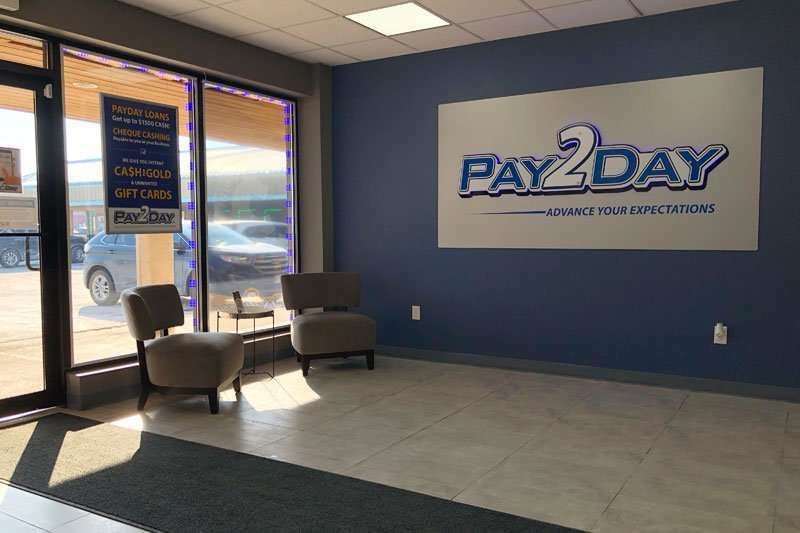 I always have a fun and enjoyable experience when I attend Pay2day on lake st. Amazing staff and always very courteous and pleasant. Will always refer business to them. What a great service and the staff is fantastic! I had a fast and friendly visit at this location and they offered me my favourite chocolate before I left! Sharon and Team are always friendly and willing to help. They always make your feel comfortable and show a huge appreciation for your business. I have and will continue to reccomend Pay2Day to my friends and family. Quick and easy process, no more stacks of loan documents as they are sent directly to my email. Thank you for looking into the situation and helping me out. The staff was exceptionally helpful and courteous. Thanks for the help ladies !